Beetroots are very high in in antioxidants, have an excellent source of folates, vitamin C and vitamin A.Beetroot when consumed uncooked aids in the protection of heart disease, strokes, to lower cholesterol and helps with anti aging. We try and eat beetroot in salads and also use it in cooking but since beetroots are better eaten raw, I also sneak them into my smoothies. The earthy taste compliments most fruit but I particularly like to add beetroot to apples and berries. 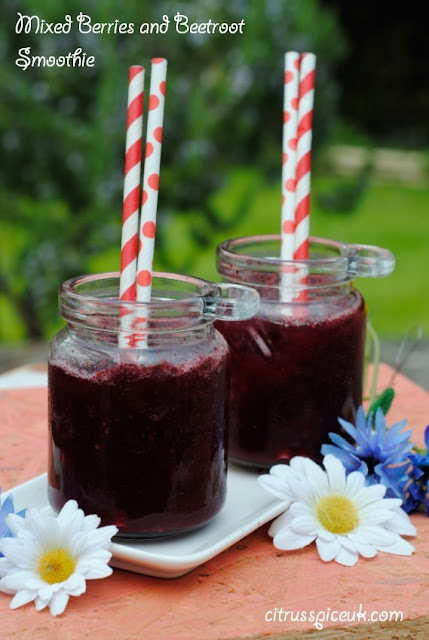 This mixed berry and beetroot smoothie has a lovely fresh earthy taste. Luscious summer berries and earthy beetroot makes this smoothie deliciously tasty and healthy too. 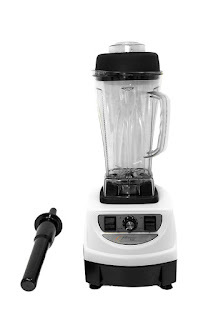 I used my Optimum 9400 to make my smoothie, you can use any blender that can crush ice.The Optimum 9400 is a powerful blender that grinds, pulses, chops, grates, cooks and makes icecreams at a flick of a switch. You can read a review about my Froothie Optimum 9400 here. This smoothie sounds absolutely delicious. I love raw beetroot so it's great to know just how good it is for us! Beautiful! :) I love beets in my smoothies, but I think with the berries, the smoothie would be out of this world delicious. Love the combination of berries and beetroot in a smoothie or juice. I love beetroot and berries, never thought of incorporating both in a smoothie, sounds and look amazing! This looks so refreshing and very healthy - I love beetroot. I really dislike beetroot if I'm honest! Can you taste it much? I know it's really good for you but I'm a bit afraid haha! I'm not a huge fan of beetroot but I like when it's mixed with other fruits such as you have done with strawberries and blueberries. This is one health- packed smoothie and the Froothie is a joy to make it in. Sounds So nice. Love Beetroot! never had it in a smoothie though. Have you ever tried Beetroot Icecream?? Its sooooooo good! This looks and sounds completely delicious! I used to love beetroot with my salads. Totally forgot about it, and would of never thought to add it to smoothie..what an easy way to get the benefits! I bet this is the kind of smoothie that is refreshing but makes your gut feel good too. I need a smoothie with anti-oxidants in right now! I frequently put beetroot through my juicer but hadn't thought of using it in my smoothies! That's a great way to combine beetroot into a smoothie, yum!!! I think beetroot is a bit like marmite, you either love it or hate it. I'm not a fan but I may be persuaded to try it in a smoothie. I had no idea beetroots had so many health benefits. I may have to make smoothies with them more often! I love beetroot in smoothies both for the taste and the amazing colour - it just cries out to be slurped in the sunshine! This smoothie looks very healthy and so delicious. Beetroot is great in smoothies - I especially love the colour it gives them! I love beetroot and berrys! This sounds so delicious! I'll have to give this a try! Especially with this nice weather we keep getting! Beetroot is a fab superfood. Sadly it's one of the very few foods CT doesn't like. However, he manages to bear it in a smoothie, so I know how well it works in them. I can't say I've ever tried beetroot, but I may give this a go because I love smoothies! I love adding beetroot to most of my cool drinks. Adding mixed berries is a treat. Colour looks so good. I love the addition of beetroot to this smoothie - makes it extra good for you! I am definitely saving this recipe. I have beets on my shopping list yet rarely know what to do with the last little guy from the bunch. That looks like a great blender! A great blender is DEFINITELY a must when it comes to making good smoothies! Oo this sounds lovely. Would never have thought about putting beetroot in.